"War Thunder CDK: Location Editor part 2"
Cockpit models don't require LOD models. Model view component AssetViewer (which also performs functions of separate assets editor and game resources building-instrument) has an apparent enough interface. The asset list shows not those files the game resources are assembled of, but the game resources themselves. The AssetViewer can also use contiguous resources in the game. Necessary information. All texture converting and model building parameters are placed in the .folder.blk files or, for each particular resource type, in <asset_name>.<asset_type>.blk. The .folder.blk files have a simple enough format and description rules, but these rules will be set forth in a separate article. Controls are very simple in the AssetViewer - by pressing "space", you switch to the flight mode (WASD+mouse), and by repeated pressing of the same key, you return to the standard way of camera control. The menu contains the option "build resources" - it's a possibility to assemble game resource packs for testing (more details in a separate article). Added with the release of the Update 1.77 "Advancing Storm", Dagor Engine 5.0 is now necessary to use. Nothing will appear to change for you when creating new objects or viewing the old ones (except for microdetails) in the latest version of War Thunder CDK. However, when you try to open or create an object with microdetails, it will not be displayed correctly since the latter are not yet connected to your AssetViewer. Go to Environment Settings (“sun” icon). Choose the section titled Environment textures. In the Level BLK (for microdetails texture) choose WarThunderCDK\levels\location_sample.blk. If you are doing the asset for your location, you will need to select‘level.blk’ for your location. 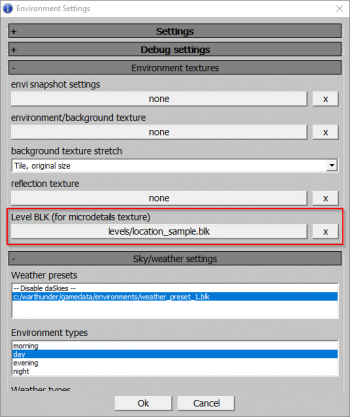 To learn how to put microdetail in level.blk for your locations, please read the following article "Creating locations”.